Happy Thursday. Get excited for mid-July. Sen. Bernie Sanders' "Medicare for All" plan would drastically change not only how health care is paid for, but who ultimately pays for it. While the wealthy and the poor usually pay the same premium for today's employer-based insurance, Sanders' plan would beef up insurance coverage for everyone and pay for it by increasing taxes on the wealthy. Driving the news: As part of yesterday's rollout, Sanders released a white paper with several "options" on how to raise the additional revenue it would take for the government to pay for everyone's health care without any premiums or out-of-pocket costs. While most people's taxes would go up, the wealthy would pay for a much greater portion of the nation's health care system than they currently do. A 4% "income-based premium" for workers who make more than $29,000 and a 7.5% "income-based premium" on employers (exempting the first $2 million in payroll) are two of the financing options. Most economists assume that the employer tax would get passed onto employees through lost wages. Other options include increasing the individual tax rate on high earners, taxing "unearned" income at the same rate as earned, and establishing a wealth tax. What they're saying: Even if all of these payment options were implemented, they still wouldn't cover the total cost of Sanders' plan, said the Committee for a Responsible Federal Budget's Marc Goldwein. He said there could also be unintended consequences of such high taxes on the wealthy, such as discouraging investment. 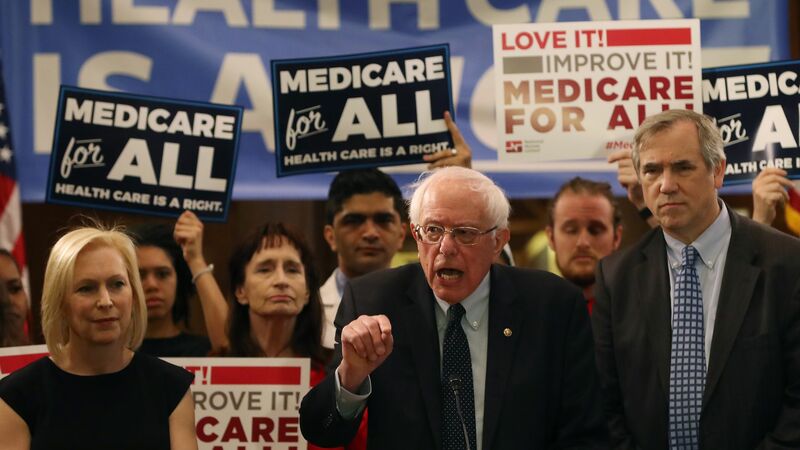 The bottom line: "More progressive tax-based financing of health care is a feature, not a bug, of Medicare for all," the Kaiser Family Foundation's Larry Levitt said. "The idea of financing health care through taxes rather than premiums and out-of-pocket costs would be fairer in some people’s minds, but also disruptive," he said. Centene's pending acquisition of WellCare Health Plans, a deal valued at $17.3 billion including debt, would create a health insurance behemoth with almost $100 billion in revenue — nearly all of which comes from taxpayer-subsidized health care programs, Axios' Bob Herman reports. This deal, being reviewed by states and the Department of Justice, raises specific antitrust concerns in Medicaid, the main line of business for both companies. Between the lines: Federal antitrust regulators made it clear in 2016 that the large health insurance megamergers went too far and would reduce competition harmfully in certain markets. While state Medicaid agencies do set payment rates for the insurers that win contracts, Medicaid insurers also compete on elements like how robust their networks of hospitals and doctors are and how well they handle people's complaints. The Trump administration has appealed a recent court decision striking down Medicaid work requirements in Kentucky and Arkansas, the Washington Post reports. The decision from two weeks ago was the second time that work requirements have been blocked in court. Why it matters: Work requirements are one of the Trump administration's signature health care achievements, especially after failing to reform Medicaid through the 2017 health care bill. If it's successful in its appeal, other red states will undoubtedly continue to pursue work requirements with the administration's blessing. Just this week, Idaho added work requirements to the Medicaid expansion approved by voters in November. Atrium Health struck out a year ago when it attempted to merge with in-state rival UNC Health Care, Bob reports. Now, the hospital system has inked a new deal to combine with Wake Forest Baptist Health, which is 90 minutes away from its headquarters. Why it matters: Research overwhelmingly shows these kinds of regional hospital mergers lead to higher health care prices (and, consequently, premiums) because providers gain negotiating leverage and make it harder for health insurers to exclude them from networks. Between the lines: The primary hook that Atrium and Wake Forest are selling is that they would build a new medical school in Charlotte. Because who could be against more doctors and research? The organizations didn’t mention how, or if, they would try to keep costs and prices down. The combined system would have almost $10 billion of revenue, which is roughly the size of Boston Scientific. The bill is an enhanced version of one introduced by Sen. Thom Tillis (R-N.C.) last year; unlike last year's, it requires insurance companies to cover treatment of an enrollee's pre-existing conditions. Both bills require insurers to cover people with pre-existing conditions and prohibit them from charging sick people higher premiums. Thanks for reading, enjoy your Thursday!